Come and join this safari in Selous Game Reserve and Mikumi National Park, Tanzania. Probably the only classic safari to the southern circuit of Tanzania, Selous Ngalawa Camp offers you the best of it. Starting and ending at Dar es Salaam, this safari will take you to the greater Selous ecosystem and give you the rare chance to experience the real African wilderness adventure in the few untouched areas of Tanzania. You will stay for two nights at Ngalawa Tented Camp. Then, you will be accommodated in Mikumi Bush Camp or Mikumi Bandas for the next two nights. The Ngalawa Tented Camp is a newly opened camp, bordering Africa's largest protected area, the untamed Selous Game Reserve.The Ngalawa Tented Camp, situated in its own forest reserve, is the original camp set up along the mighty Rufiji River near the Mtemere Gate, the eastern gate to the Selous Game Reserve. The client will be picked from the place of staying in Dar es Salaam and drive to Selous Game Reserve with a packed lunch. 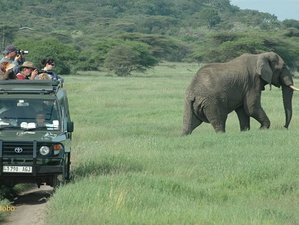 The journey will take about five hours through the most unexplored and untouched areas of Tanzania. You will arrive at Selous Game Reserve in the afternoon in time for the boat safari, where you will admire hippos and crocodiles in their natural habitat. Dinner and overnight stay will be at Ngalawa Tented Camp. After breakfast, you will have a full day game drive in the Selous Game Reserve, which is rich with wildlife, including buffalos, lions, elephants, zebras, giraffes, impalas, warthogs, hippos, and crocodiles. Your accommodation will be at Ngalawa Tented Camp in a full board basis. After breakfast, you will have a walking safari for two to three hours and proceed with a game drive en route to Mikumi National Park via Morogoro over the Uluguru Mountains across rivers and past small local villages and farms for a sunset game drive in the park. Dinner and overnight stay will be at the Mikumi Bush Camp or Mikumi Bandas (inside the park). In the morning after breakfast, you will have a full day game viewing in the park. The Mikumi flood plain is the main feature of the park along with the bordering mountain ranges. Animals commonly found here include lions, elands, hartebeest, buffalos, wildebeest, giraffes, zebras, hippos, and elephants. The Mikumi elephants are mainly grazers and do not cause tree damage. Dinner and overnight will be at the Mikumi Bush Camp or Mikumi Bandas (inside the park). Early in the morning, you will have a sunrise game viewing. Then, back to the lodge / camp for brunch. In the late afternoon, you will have a game drive en route back to Dar es Salaam. This is the end of the safari service. Your safari holiday will take place in Selous Game Reserve and Mikumi National Park, Tanzania. Please book your flight to arrive at Julius Nyerere International Airport (DAS). Transfer from and to the airport is included. Selous Ngalawa Camp will pick you up from the airport. Airport: Julius Nyerere International Airport Airport transfer included: Julius Nyerere International Airport No additional charges. You can request this in the next step.